It was not a performance to capture the imagination but no one said redemption for their worst World Cup showing for 80 years would be achieved overnight. Germany’s first game since their group stage exit in Russia 71 days ago ended in a goalless draw against world champions France on a night when their supporters seemed happy to consign that particular ignominy to the past. 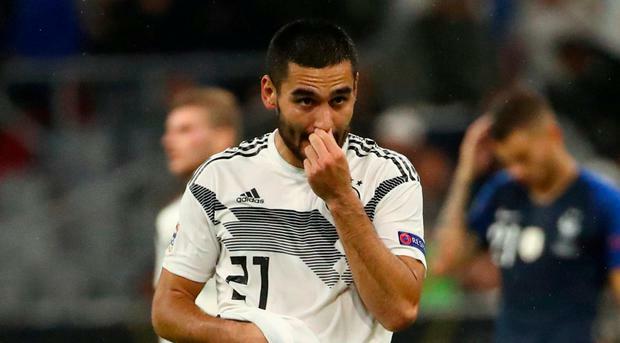 That did not mean an entirely comfortable evening for Ilkay Gundogan, who was given a mixed reception upon his introduction at the Allianz Arena and to whom some animosity still lingers, but Germany avoided the defeat that would have asked more questions. Just as the German Football Association kept trust in Joachim Low to kickstart a revival, so the coach has placed his faith in many of the players who flopped so badly in Russia to drag Germany back into the light. With the notable exception of Mesut Ozil, heads have not exactly rolled and, whether it yields an upturn in the longer-term or not, Low seems to have resolved that the best way forward is essentially to preserve the status quo for now and gradually integrate the country’s younger talents over time. A quick glance at the Germany bench offered a reminder that it would be foolhardy to rush into thinking Russia marks the start of sustained slump for the Nationalmannschaft. Julian Brandt, Niklas Sule, Leroy Sane, Kai Havertz, Thilo Kehrer and Jonathan Tah, to name but six, certainly offer hope of a brighter future. But, for the time being, Germany need to restore shattered confidence and re-establish some of the order – and aura – that was obliterated over 11 miserable days at the World Cup when the pre-tournament favourites imploded amid chaos on and off the field. Seven of the team that began that calamitous 2-0 defeat to South Korea in their final group game were entrusted to start here against France. Some starters – Toni Kroos, Manuel Neuer among them – came as no surprise but Jerome Boateng and Thomas Muller, two of those who suffered most in the summer, clearly have a lot of credit in the bank with Low. It was clear the Germany fans had already forgiven if not quite forgotten. They had formed a heart shaped mosaic of German flags in the south stand of the Allianz Arena while the powers that be offered a pointed reminder of happier times on the field by parading four separate flags denoting the year of the country’s four past World Cup triumphs. The only person to whom the warmth did not fully extend was Gundogan, whose introduction midway through the second half elicited polite applause from some and audible whistles from others. The Manchester City midfielder had sparked outrage before the World Cup after being photographed alongside Ozil with President Erdogan of Turkey and it is clear there are still some who are not yet ready to forgive Gundogan. It had been a low key affair up until that point. While Germany were clearly keen to put down some sort of marker, France seemed to be holding plenty in reserve. Antoine Griezmann tested Manuel Neuer with a couple of shots after Olivier Giroud had forced a good save from Neuer. At the other end, Timo Werner shot straight at Alphonse Areloa but the biggest mark Germany left for the first hour of the game was a gash across Benjamin Pavard’s neck after a crude challenge from Antonio Rudiger early on. It wasn’t a pretty sight but the Chelsea defender escaped punishment. Germany looked a little unsure, a little ring rusty in those opening exchanges, which was probably understandable in the circumstances.